Stone walls: 8 fantastic ideas! Are you bored of smooth walls? Do you love design, modern decor, innovative trends for the home and you are looking to change your own house? Perfect! 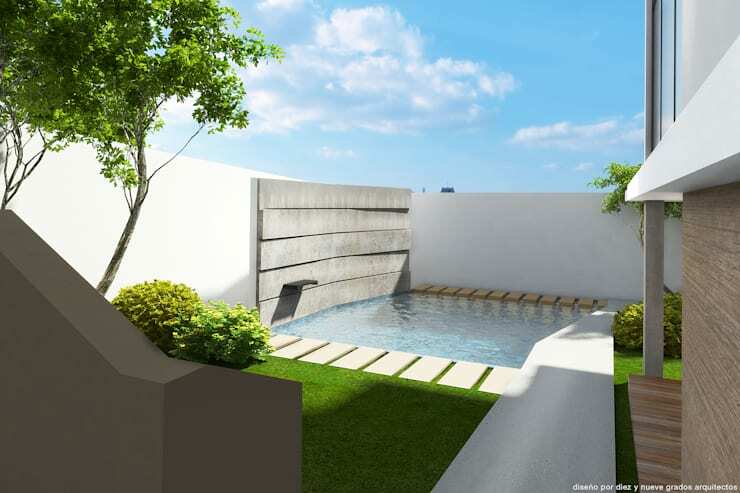 You are reading a guide of ideas that could revolutionise the look of your home completely. 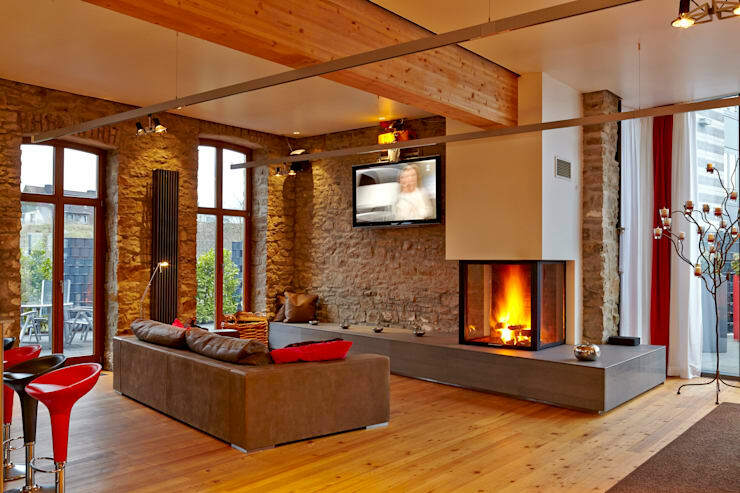 Take your home decoration to another level with stone coverings! We are sure that after reading these eight great ideas on stone coatings you will be as convinced as we are of the visual power of stone walls. Yes, it’s true, you absolutely do not need to settle for the appearance of your home’s walls and concentrate on buying furniture, fabrics and decorations to suit it, you can also go deeper and transform your walls to create place that looks entirely different. 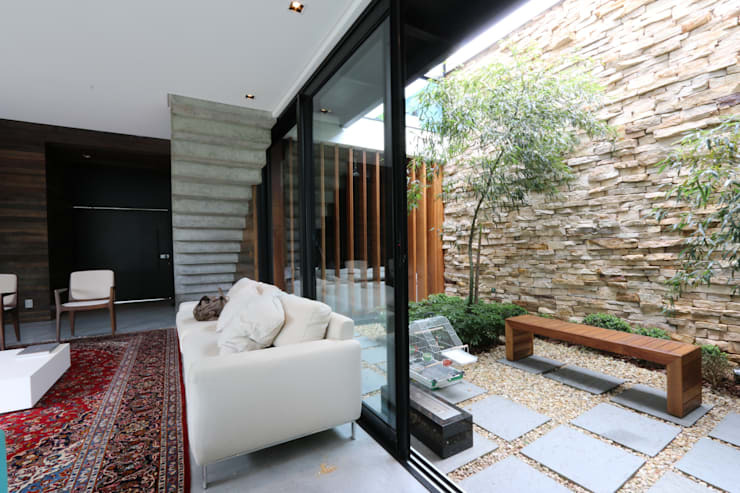 A stone coating can give any space that sharp modern style you want, or an aura of mystery and seriousness, or even a cosier atmosphere with a sense of calm. Walk with us through these 8 designs and find the wall that goes with your taste and your home. Can you imagine a room with a classy stone wall? Well, prepare to be inspired! 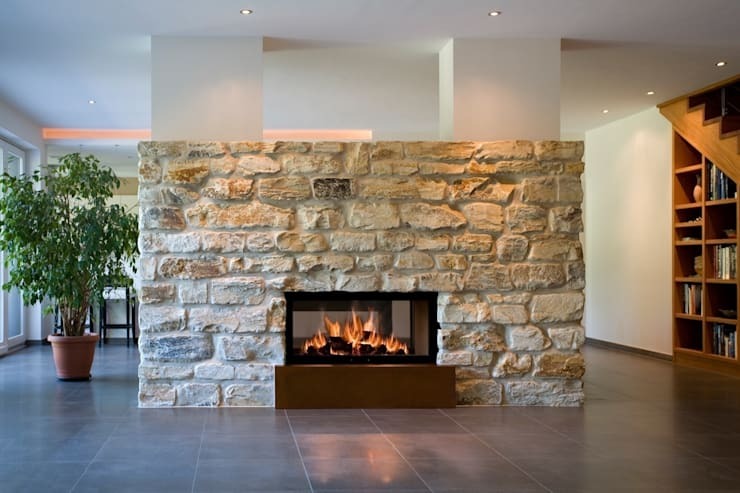 Regardless of the stone we choose, we believe that the pattern and design achieved by means of a stone wall will isolate and highlight a space in your home. Stone coatings are one of those design elements that are indispensable to create a good atmosphere and break all the boring dynamics of the rest of the house. In addition, the contrast created in the house becomes an element of interior architecture that cannot be overlooked. So, while separating a room, it also makes the whole house a much more innovative space full of contrasts with spectacular sets of materials and textures. The great advantage of stone walls is that the stones can be found in all sizes, designs, colours and shapes. You can choose from granite to river stone. From small to the smallest, you can dye some stones and you can even buy flexible plastic panels that have a very realistic stone look. The options are endless, because in addition, there is no limitation on where to put the stone coatings, as it is such a durable material you can put it outdoors without fear of damage, or in a bathroom without thinking of moisture, or even in the kitchen because it is non-flammable. Stone is surely one of the most versatile materials available! It is a design that can be combined with any floor, ceiling or type of furniture because there will always be a type that suits your needs and tastes. Some clear stone coatings are excellent to give a feeling of a space to an outside terrace. When stone is not worked, polished and amalgamated into a wall evenly, it takes us back to more rural places, like a cottage in a field, where the walls and buildings are made by mounting stone after stone without having to create a large building, and usually by manual labour. A rough white stone wall is the best idea to give our house that rustic, elegant touch, it is the improved version of marble. You have to try it! Stone also has a cooler side, when used correctly. When dark stone colours are chosen, it gives a room a feeling of efficiency and power. This works with a much more regular pattern, no less hollow, yet very compact. Dark stone decoration reminds us of all those comedy films where they wanted to emulate the powerful office of lawyers or devils. This is because the black and compact stone brings to light an ambitious, dangerous and power-loving personality. A room with a coating of this type is perfect for the lover of order and high goals. Playing with different colours of stones in the same pattern has a charming effect on any design, and we see this in designs by Kabaz, who makes coatings of natural quartz, taking advantage of the breadth of tones and colours available. 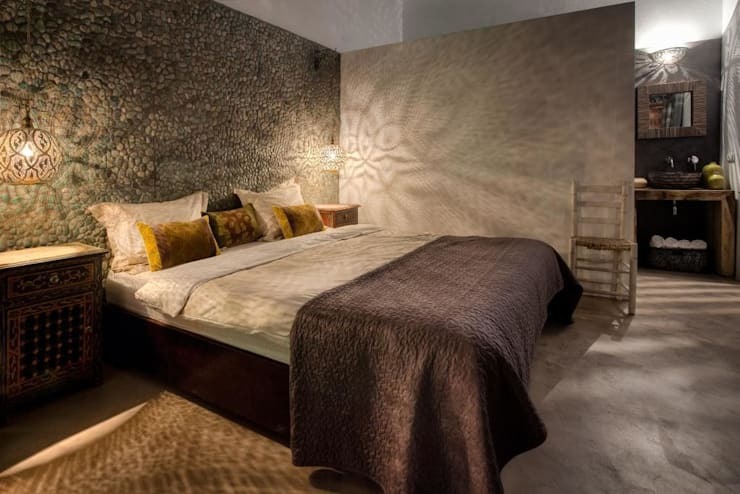 In the case of this image, we see a wall covered with river stones, which gives a youthful and playful touch to the room, perfectly complementing the purple blankets and pillows in yellow fabric. River stones always have slightly different shades, but not completely different, so as to create a texture of the same colour that even seems to move. Sleeping in a room with a wall of river stones may remind us that everything in life is always slowly moving, but stays in equilibrium. Stone can also be smooth and uniform, which will help with and decorator wanting to create a minimalist feeling in the house. A smooth stone wall is just enough to decorate a space; making it look elegant, fine and without rough ridges. Moreover, the variation of designs with polished stones can make your home a work of contemporary art. The different shapes and positions with which you can design a wall will give your home a unique and very creative touch without great efforts and eye-catching colours. The art of a good stone wall that can be very expressive on its own! Stones are durable and precious. It is not for nothing that it was used since ancient times in large buildings, such as churches. Its essence is more natural and heavier than many other building materials used today in homes, so adding a stone coating is an exciting prospect. It creates the feeling of standing in ancient architecture, and feeling contact with the most primal aspects of mankind. Putting up a stone wall means wanting to create spaces with a vintage, ancient, mysterious and mystical air. Stone can turn your room into temples or places of rest and reflection. When choosing your furniture, you will discover that spaces near the stone wall will instantly acquire an interesting, innovative and mysterious atmosphere. As we have alluded to throughout this article, stone can give an atmosphere of two polarities: warm and cool. Stone produces a warm atmosphere because it gives us a homely feeling which is tender, rustic and approachable. It ensures cosy and personal spaces. 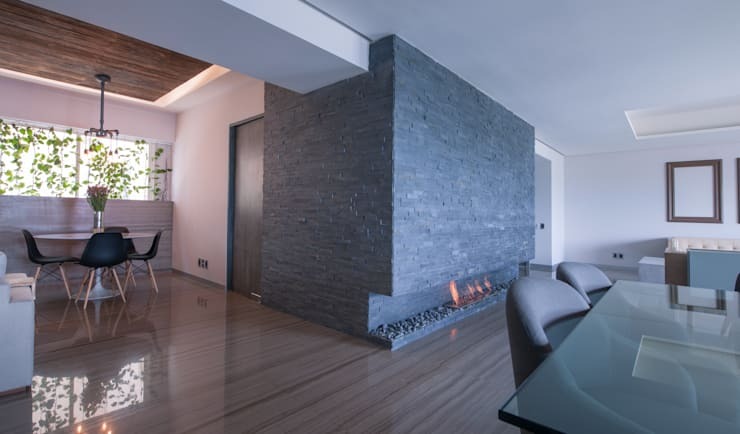 For these reasons of versatility and many more, we believe the stone is the best idea to cover your walls, but are you convinced? If not, take a look at how stone is used with beautiful effect on the exterior of: This stone cold classic! 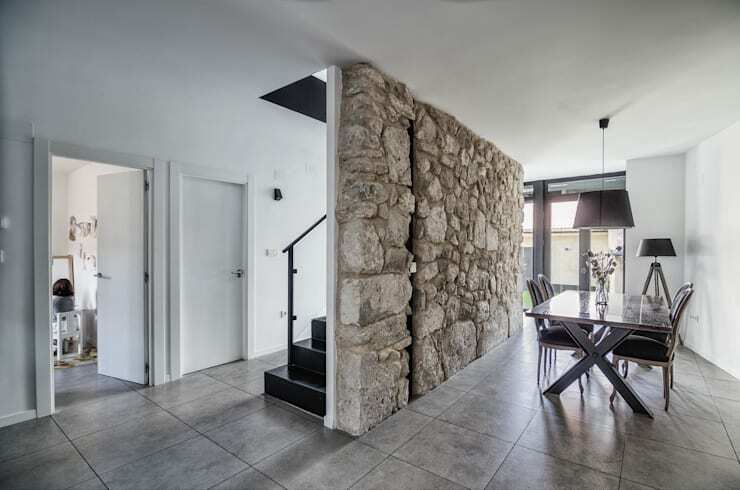 Which of these stone wall designs is your favourite?